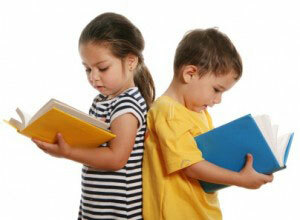 methodology, students can learn to excel in their reading and writing skills. we introduce a series of sounds and their corresponding letter(s), and how those sounds blend together to form words. For instance, we might start by teaching students the letters and sounds for p, f, s, t, and a. We would create audio-visual sound cards for each letter, with the letter on the front and a key picture on the back. P might have a picture of a pizza on the back, f might have a picture of a fish, s might have a sun, and so on. With the student’s desk cleared, the teacher or parent starts by saying, “This is the letter p (holds the front of the card up), like pizza (turns card around), it makes the sound /p/.” The student repeats that sequence with the instructor and then tries it on his own three times. Next, we move into skywriting. The instructor holds her hand in the sky and says, “When we write the letter p, we go down, up, and around (as she forms the letter in the air).” The child repeats the formation in the air with the teacher, and then tries it on his own. We then bring out a tray of colored sand. The instructor traces the letter p in the sand, and the child traces it on his own in the sand three times. We follow the same sequence for each of the four consonants (p, f, s, t) and short vowel (a) in the group of letters we are focusing on. Once the student has mastered the sounds/letters, we are ready to form both real and nonsense words! We can use our note cards or magnetic tiles to create words such as sat, pat, tap, and so on. When students are ready, we read word lists, sentences, and stories containing these sound patterns. From there we move into other groups of consonants and short vowels (such as n, r, c, k, e, etc. ), and eventually blends, digraphs, vowel teams, silent e words, and so on. At the start of each session it’s important to always review any old sounds before moving onto new ones, and to integrate these previously taught sounds into the lessons. By teaching and reinforcing this technique, your students will be reading in no time! Dr. Emily Levy is the founder and director of EBL Coaching, located at Eblcoaching.com, which offers one-on-one and small group tutoring and organizational coaching. Visit the website to learn more about dyslexia and the Orton Gillingham method in NJ and Orton Gillingham tutors in NJ.